Are you frustrated with your Shared Hosting Provider? Is your hosting reaching the resource limits? Does your site load too slow?- Then there is the only one solution, that is Managed WordPress Hosting. A Managed WordPress Hosting comes more powerful that is specially built for hosting WordPress sites. It provides many incredible features and services as well. This includes enhanced security, ultra blazing speed, automatic updates, daily backups, great uptime, premium support etc. Managed WordPress Hosting offers completely hassle-free experience. Around 15,900,000 websites on the entire web use WordPress which are completely self-hosted. Due to the vast popularity of WordPress, many web hosting providers chose to be the specialist of WordPress hosting. Managed WordPress Hosting is actually a shared hosting, but their service quality, performance, speed and support differs from the Shared Hosting. Premium WordPress Hosting price is more expensive than shared, where a Shared Hosting price starts from only $2.97/mo. Well, the price doesn’t matter if you want a high-quality host which can easily handle a high volume of traffic, top-notch performance, great uptime and of course 24×7 WordPress expert supports. Blazing Fast Speed: As Managed WordPress Hosting specially built for hosting only WordPress, it makes your site blazing fast and even on high traffic. Enhanced Security: Every Managed WordPress Hosting provides multi-level security options for websites. It scans your site every day for malware and vulnerabilities and stops brute force attacks. Anyhow if they find any malware on your site, then they take the responsibilities and removes it instantly. They also offer free SSL certificate via any 3rd party provider. Free Site Migration: They provide free site migration. So you can easily move your site to them without any downtime. You can also ask your hosting provider to do it manually. Staging Areas: You can create a perfect copy of your live site in a sandboxed environment with just a single click. This staging area is mainly used for tests, developing the latest and greatest version of your website and it doesn’t affect your original website. Automatic Daily Backups and Updates: They provide daily updates and it can be done automatically or manually. You can restore any of the backups anytime. With the Automatic Update system, your WordPress version and plugins will get updated. No Downtime: Their futuristic infrastructure keeps your site always online and can handle a massive amount of traffic. 24×7 WordPress Expert Support: Their WordPress experts are always with you. If you have any problem regarding your site, they will fix that at no time. There are many Managed WordPress Hosting companies available which offer different features and plans. But choosing the perfect hosting is not easy by depending on your need. Some web hosting providers also charge an extra penny for adding an extra service and some hosting already includes the same feature. 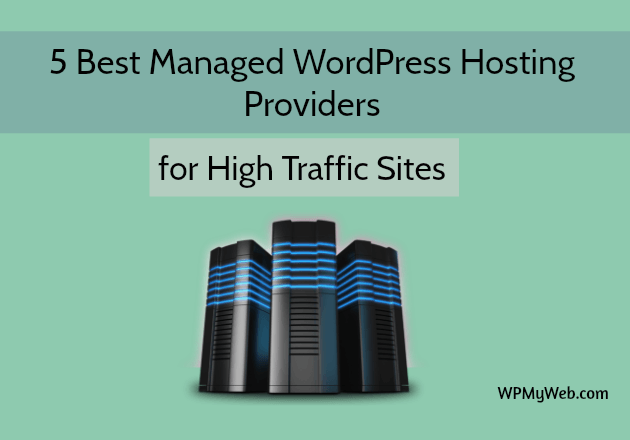 So we built a list of 5 Best Managed WordPress Hosting for High Traffic Sites based on their features, price, hosting performance etc. Kinsta is powered by Google Cloud Platform. It is one of the best Manged hosting providers for WordPress. If you have a large website that gets millions of traffic, then Kinsta will the perfect choice. Unlike other web hosting providers, it offers unlimited page views and unlimited visitors. So it doesn’t matter if your traffic growths. All of their storages come with high-performance solid SSD that makes your site blazing fast. You can host only 1 website on their starting price and each of their plans, you will get 4 PHP workers that help to execute codes on your WordPress site. Migration is free and you can immediately migrate your site with zero downtime. Kinsta admin Dashboard is packed full of advanced features that are easy to use. From the admin panel, you can manage your all sites. Unlimited Pageviews: Kinsta offers unlimited page views, unlimited visitors to their users. So you don’t need to worry if you get more traffic. Free Migration: You can migrate your site to Kinsta anytime without any downtime. Each plan includes one or more free migration. All you have to do is send a request from your dashboard and their expert will do the rest. Cutting-edge Admin Panel: The Kinsta admin is packed full of great features and easy to customize. The admin panel also looks different and modern than other hosting providers. Highly Secure Network: Their all networks are highly secured by security protocols and firewalls, daily backups and more keep your site safe 24/7. They also provide 1440 uptime checks. So if your side goes down, it will instantly notify you and their expert will check if anything wrong with your site. Multiple Data Centers: Kinsta offers three locations in multi-regional mode: US Central, Europe, and Asia-Pacific. Expert Support: With the support ticket, their expert WordPress developers will have you out on any issue related to your site and they are available 24/7. Pros(+): Kinsta is powered by Google Cloud Platform and it brings you lightning-fast page load times. They offer their special Kinsta-Cache plugin, that allows you to clear the cache on appropriate pages of your website. Besides, their expert helps you to migrate your existing WordPress site without any downtime. You can add any 3rd party CDN provider like KeyCDN or CloudFlare easily. 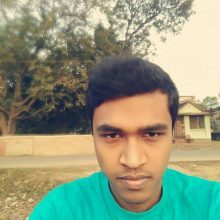 Their WordPress expert team helps you to fix any kind of problem-related to your site in just time. Cons(-): Actully, I didn’t find any negative point of Kinsta. But their hosting starting price starts from $30/mo, which is kind of expensive for a beginner. WPX Hosting formerly known as Traffic Planet Hosting. 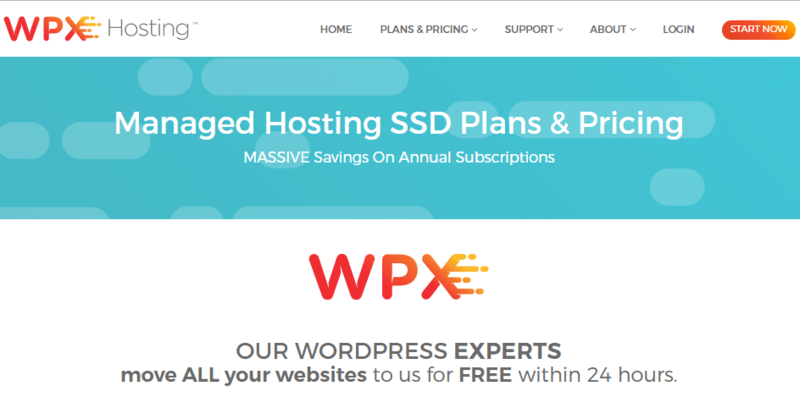 If you want a cheap Managed WordPress Hosting, then WPX is a good option, as it comes at a very affordable price and providing same features like other Managed WordPress Hosting. Their starter plan offers total 5 free site migration and you can host up to 5 websites. They also don’t limit of any monthly page views but instead of limiting page views, they provide 50 GB of bandwidth. But you can increase bandwidth by upgrading your plan. Each plan includes daily backup and the latest version of PHP i.e 7.0. Cheapest Plan: WPX Hosting offers the cheapest plan than other Managed WordPress Hosting providers. Their price starting from $19.99/mo and provides all kind of features. Website Allowed: Unlike other managed hosting providers, WPX allows 5 websites on their starter plan. No Monthly Page Views Limit: They don’t have any monthly visits limit, instead of this you will get 50 GB of bandwidth. 5 Free Migration: As they allow to host 5 websites, so you will get 5 free site migration. Free Unlimited SSL: You can use SSL on your unlimited number of site. With this, they are also providing free domain privacy. Expert Support: All of your site related problems and help are handled by WordPress experts and you can reach them through live chat at any time. Pros(+): Their hosting plans are so cheap than other Managed WordPress Hosting Providers. With that cheap price, they almost provide all features. You can host more than one site and can use unlimited SSL. Besides, they don’t limit your monthly visits. They also offer staging area. WPEngine is a business class managed WordPress hosting provider and provides best quality support. 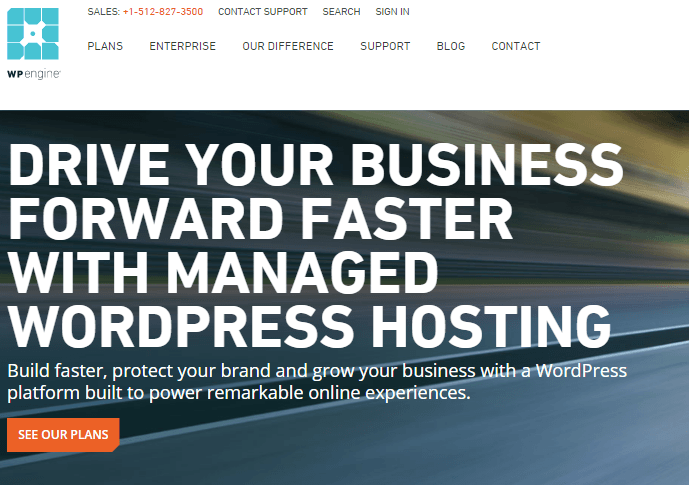 If you already searching for managed WordPress hosting, then you probably notice their name. If you have a personal blog or a business website that gets a high volume of traffic, WPEngine makes it more convenient. Their starting plan starts from $35 per month and you can host your one WordPress website. Each plan includes SSD storage, Staging, free site migration, 24×7 Chat support. Free Site Migration: Like other Managed Hosting Providers, WPEngine also offers free site migration. This feature is available on their every plan. Unlimited Data Transfer: WPEngine provides unlimited data transfer so you can host almost any kind of personal, small or big websites. Instant Staging: With their Staging feature, you can instantly create a copy of your website for the testing purposes and your original website remains same. LargeFS: LargeFS transparently gives you infinite storage for media. You just need to integrate with your Amazon S3 account from WPEngine dashboard. 24×7 Customer Support: They WordPress experts are ready to help you 24×7 through phone, live chat, and ticket system. Pros(+): WPEngine is the most popular Managed WordPress Hosting Provider and there are so many big brands like SoundCloud, Foursquare, HTC etc using WPEngine. Their multiple security layers protect your high-value content, boost your SEO and speed up your site 5x than average. Furthermore, you can backup and restore your site using their premium backup system and copy your site with just a single click. If you get any trouble with your site, their WordPress expert will fix the problem in just time. *They have blocked some WordPress plugins that are harmful and slow down your site. Many users think it’s a bad choice to disallow them. But in my opinion, it’s good for your website which are disallowed. If you really need so, you can contact with their expert. So this is a (+)ve point. Cons(-): WPEngine hosting price somewhat cheap but they don’t offer unlimited page views on their any plans. Besides, their starting plan doesn’t include CDN. So you have to pay extra to add CDN service. If you are looking for a Managed WordPress Hosting Provider for professional designers, agencies, developers and blogger as well, then Flywheel is the perfect option. Flywheel made it super simple to collaborate with other developers and there’s no need to share anyone’s username or passwords. As an organization or Team, all of your team’s sites are on a single dashboard. So everyone has the privilege to create their site and can pay bill individually. You can also create a blueprint of your existing site that will save your theme and plugins as a custom configuration. And later you can apply that configuration on your next site. Blazing Fast Speeds: Flywheel empowers every WordPress site with faster load time. Multiple Accounts on a Single Dashboard: If you run a Company, then you can provide access to your employees so that they can build their own website separately. Besides, they can pay bill individually. In fact, the payer will be granted as ownership of the account. One-Click Staging: Like other hosting providers, Flywheel also offers one-click staging to test your site in a sandbox environment. Create Blueprints of Your Site: You can easily create a blueprint of your existing site and apply your site structure(themes, plugins) to a new site. Multiple Datacenters: Flywheel has total 10 Data Centers around the world and you can launch your sites close to your users without any hassle. Pros(+): Flywheel is a great option for those who are designers, developers, and bloggers too. If you running an Organization or Team, you can give access to your agencies separately to do their work and can manage bill too. You are allowed to migrate your site free using their simple dashboard. Their plan starts from $15/mo, which is a cheap plan for beginners. Usually, as your site grows, you will be asked to upgrade your plan without any cancellation. They also provide the nightly backup system which runs 30 days and you can restore at any time. Cons(-): Like WPEngine, it doesn’t offer CDN and allows only 5,000 visits on their starter plan and personal plan. 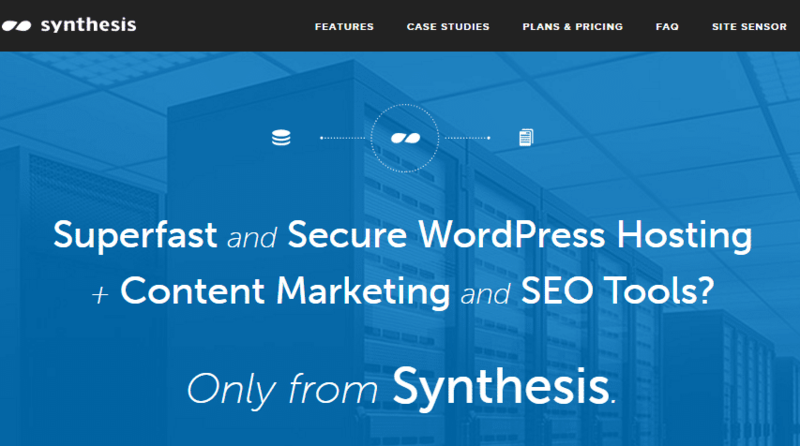 Synthesis is a VPS powered Managed WordPress hosting. They provide highly customized NGINX and PHP-FPM web server software which are mainly used on the large website that takes your site to the next level of performance. Synthesis doesn’t only host your website but it also gives you step by step on-page optimization advice and Keyword and social media research that your site can rank higher on Google. And all those things you can do directly from your WordPress admin panel. They use a special technique called “Self Healing Process” which determines the health of all software processes on your VPS and if something goes wrong or gets hang, it instantly does an auto-restart to bring it normally. Their standard plan starts from $47/mo, which allows you to host one domain and offers 1 GB memory, 20 GB total storage, 2 Tb monthly bandwidth and 10,000 daily traffic. Allows High Traffic: Their starter plan offers 10,000 visits per day. Top-notch Performance: With their NGINX architecture, they radically improved your site performance and can handle extra load easily. Even their starter plan handles a heavy load compared to other Managed WordPress Hosting Providers. Besides, this also increases site speed. Extra Security: Synthesis uses two different scanning technologies to examine your site for malware and vulnerabilities. They specially use Securi to check malware, prevent your server from brute force attacks, and all security checks are done on every 6 hours. If they find any malware in your server, they take the responsibility of removing it so you don’t have to worry about it. Real Time Monitoring: iWatch enables real-time monitoring of critical files. Apart from that, Synthesis uses their specialized monitoring tools that monitor your site 24/7/365 to ensure maximum uptime and respond to issues as they arise. Site Optimization Tools: Unlike other Managed WordPress Hosting Providers, it provides you On-Page optimization, Keyword Research and Social Media Research tips to help you rank better on Search Engine Results. Personal Backups for S3: They backup your server daily and store seven days’ worth of backups. With their personal backup system, you don’t need to depend on any 3rd party software to backup your site. Their customizable server-side processes out critical components to your own S3 Bucket on Amazon Web Services. Pros(+): Synthesis provides Managed VPS rather than Managed WordPress Hosting that gives an extra boost to your site. All of their plans include highly customizable NGINX and PHP-FPM web server. Their each plan includes Self-healing process, iWatch support, site optimization kits etc. Another most important thing is that they provide extra security layer for your site so your site stays always safe and online. Their standard plan offers 10,000 visits per day that equal to 3,00,000 visits per month, even none managed WordPress hosting providers don’t offer it at the same price. Cons(-): They don’t support Multisite WordPress installs. As we mentioned above that a Managed WordPress Hosting is always better than a Shared Hosting in all categories. If you have a large number traffic on your website or big website, then you should immediately switch to Manage to host. Because Shared Hosting is good for beginners and can handle light traffic. Besides, Shared Hosting doesn’t provide all features and has fewer security options. By using a Managed Hosting, you will get everything and better quality i.e it can handle more traffic, increase site speed, multiple layer security, free SSL and WordPress express support. It gives your site more power and hassle-free, so you can focus on your work and grow your production. But choosing the Best Managed WordPress Hosting Provider is not easy. In the above scenario, we have discussed 5 Best Managed WordPress Hosting Providers, which provide differently kind of features. > If you are a Blogger or Developer, then WPEngine will be the perfect choice for you. WPEngine almost provides everything and their price also cheap. They offer free migration, SSL certificate, Staging area as well. Their WordPress experts also stay available 24×7. You can reach them through live chat or support ticket. Their ticket response time is amazing, takes around 1-2 hour only. But their starter plan has some limitation like pageviews and CDN not included. You may need to pay extra for adding additional resources. > If you have a big business website, blog or brand, which gets millions of traffic, then go for Kinsta. Kinsta is powered by Google Cloud Platform. It offers a unlimited number of pageviews, unlimited visitors, free migration, 4 PHP workers, 1440 daily uptime checks and plus staging environment. However, their price is a bit expensive, but hosting quality is stunning. For professional designers, agencies, developers and bloggers, Flywheel is the best option. It is also WordPress Recommended Managed WordPress Hosting. From the dashboard, your clients can access and can pay individually. Like other Managed WordPress Hosting Providers, Flywheel also offers almost everything as a Webmaster needs to develop his/ her site. Their special feature “Blueprint” helps you to create a custom structure of your site including plugins and themes. And later you can apply that configuration on your next site. If you ask me to pick up the best, then I will recommend you to get WPX Hosting. It is formerly known as Traffic Planet Hosting. They offer everything like other premium hosting companies and price also cheap. Unlike other Managed WordPress Hosting Providers, they provide A-Z features with affordable price and can host your 5 different websites. But they don’t provide Staging feature. Go for : WPX Hosting.